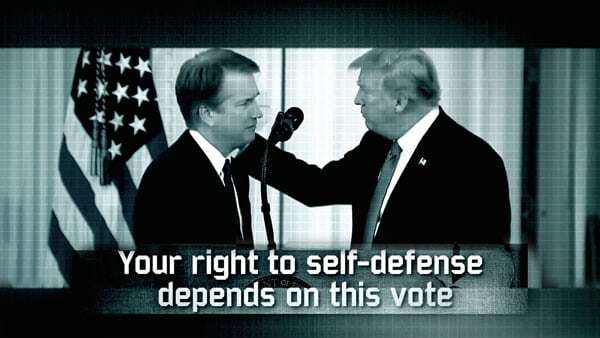 When Brett Kavanaugh was confirmed as a US Supreme Court justice on Saturday, the NRA (National Rifle Association), among other pro-gun groups, celebrated because Kavanaugh is known to be a strong and eager proponent of the Second Amendment. The NRA, broke as they are reported to be, spent a good deal on a pro-Kavanaugh campaign ad, which includes NRA president Oliver North speaking as “clips of Democrats doctored to look like fuzzy newsreels from a guerrilla republic” are run. The power of that ad is described as follows by Scott Cullather, CEO of brand and communications agency INVNT, in an email to ThinkProgress. The NRA is very clever because their marketing reframes the actual “thing” into something much bigger, broader, and more emotional. It’s about good vs evil. It’s about a particular set of values that are being positioned as being under attack. This isn’t about one man’s qualifications (or disqualifications) for an open job position—it’s about an entire way of life. All the best marketing does that. Levi’s aren’t just jeans—they are freedom. Coke isn’t just fizzy sugar water—it’s joy and togetherness. This isn’t about a man and whether he’s a good pick for the Supreme Court or not—it’s about a liberal attack on conservative American values. Today is another heartbreaking day in America. The majority of Senate Republicans and Democrat Joe Manchin, ignoring the pleas from hundreds of families and survivors directly impacted by gun violence, cast their votes to confirm an NRA-supported judge to the Supreme Court of the United States.